Your existing content could be keeping your visitors on your site longer to read more pages. More importantly, you can boost traffic to the pages that generate sales and subscriptions. While you could do this manually by analyzing your analytics and custom coding banners, call-to-actions, and manually suggesting additional posts related to the one your reader is on, that is totally unnecessary. And most of us never get it done! Tools exist that will do this for you automatically. This post will explain how one such tool works. Trendemon refers to what they do as “website amplification”. TrenDemon starts by automatically identifying the top performing pages on your site. These are the pages that generate more leads, sales or subscribers. By then displaying an image on each of those pages in what they call ‘lift units’, your existing visitors are enticed to click through to the pages that convert best. Basically, you end up using your most compelling content to keep your existing visitors on your site longer – but more importantly – to increase conversions. Additional benefits include reducing your bounce rate and increasing time on site. These two metrics are important to improving your search engine rankings and could lead to more search engine traffic. Do you know which of your pages generate the most subscribers, leads or sales? While you could create goals in Google Analytics or another analytics program, many don’t because it is so confusing. Goal creation is much easier in TrenDemon and you don’t have to figure out which are your top converting pages at all. The tool does that for you automatically. To get started, simply add a line of code before the closing body tag site-wide. Most content platforms provide a way to add code into a box that places it on every page. It could also be done manually. If you use WordPress, install the TrenDemon plugin. Be sure to locate the confirmation email and confirm. Then the tool will go to work analyzing your content. You can wait for that or go ahead and start setting up your goals. One goal common to all types of sites is getting visitors to subscribe. The first step to building a mailing list is to add the ability to subscribe to your site. You might use a simple box for an email address or a longer form. The shorter the form, the better. Just a name and email address is enough to start. You may have noticed that many sites only use first name. Some ask for full name. The less information you request the more likely someone is to subscribe. You can see examples of two methods on this site. Note the orange and black box with the text Small Business Success with a video in it in the right sidebar (column) on this page. Adding name and email here puts my visitors on a list in my account at Priceless Possibilities. They are sent a pre-written autoresponder series and I could send them additional messages at any time. The other email subscribe box allows my readers to subscribe to my posts. Getting more people to subscribe is a common goal. 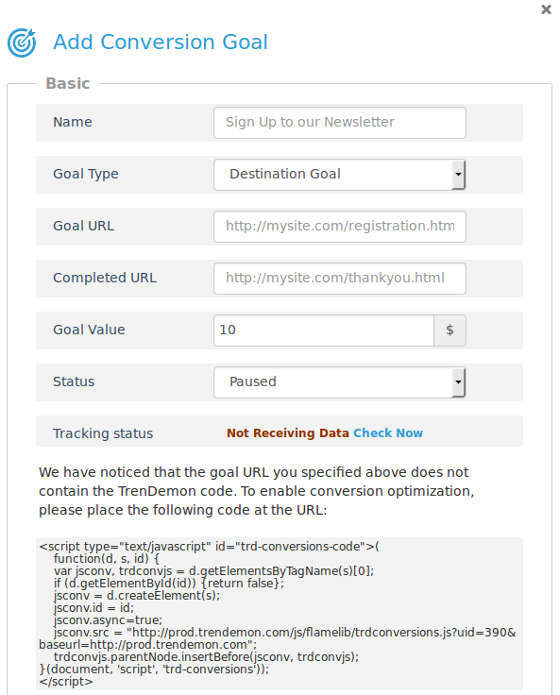 To create goals in TrenDemon, simply click on goal and add two URLs. The image below is the actual form you fill in to create your goals. The “Completed URL” would ideally be the page someone arrives at AFTER they actually take the action you desire. This could be a thank you for subscribing page or an order confirmation page. While you could use the URL of the page where they subscribe, that is not nearly as beneficial as knowing how many actually fill in the form and complete the process. The goal URL pages must have TrenDemon code on them. If you can’t access that page because it is not on your site and you don’t have that capability on the domain it is on, you may be able to redirect subscribers or buyers to a thank you page on your own domain to use as the Goal URL. Notice the Tracking Status “check now” button in the above image to determine whether the Goal URL you want to use has the code on it or not. Don’t let not knowing the amount to put in goal value prevent you from setting up goals. It defaults to $10. TrenDemon can handle multiple calls to action. You can upload a banner or create a lead form. To use a banner, create an image of the specified size to upload. When you create a lead form, it is created in Trendemon, but the data can be sent to your regular email solution or exported as an Excel or .csv file. You can use multiple CTAs and control which appears where in the Trendemon discovery panels. What are Lift, Show and Side Units? The lift unit rises up in the bottom right corner of your site. Show units fit best at the bottom of your content. It shows images that link to your content three at a time which scroll across. It has arrows on either side to allow users to see more or back up to something they found interesting. It also contains a call-to-action. The side unit is similar to the show unit with your favored call-to-action and using images to get visitors to visit more posts. Use the administrative panel to select which units you want to use on your site. The show unit was turned on by default when I installed it. This could change, but these settings are easy to alter so play with them to see what you like best and what works best for your site. 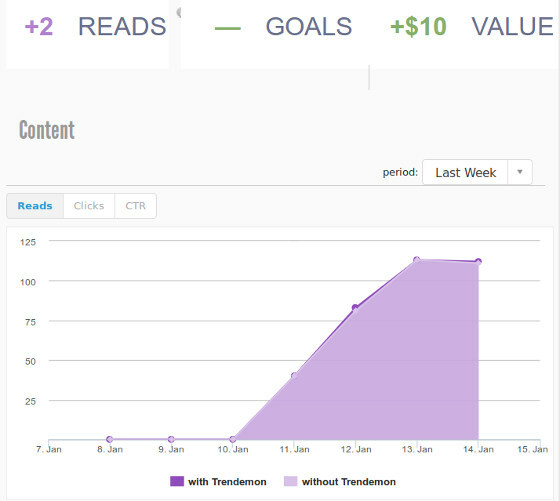 TrenDemon provides visual graphs that make it easy to see how your content is performing. Their content graph shows you which articles have the highest click-through-rates (CTRs). 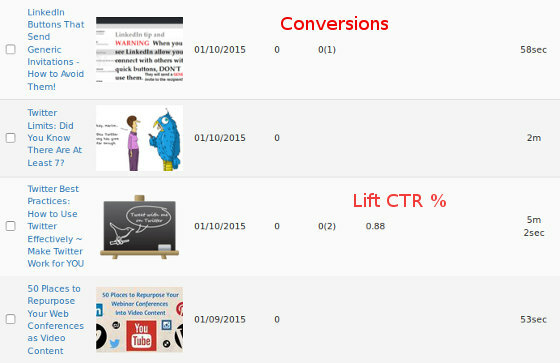 It also shows total clicks on the posts and pages being recommended in the lift, show and side units. The screen capture above shows posts that generated conversions (in this case subscribers to my site). The Lift CTR % is conversion that occurred because the TrenDemon show unit got someone to click from the page they visited to the Twitter Best Practices post. The visitor subscribed after reading that additional post. These amounts are not total traffic, so they appear to be only the views on some specific number of posts or pages TrenDemon is measuring. If you look at the pricing page you’ll see that TrenDemon is free for publishers because it can be used to monetize from external content promoted on your site. 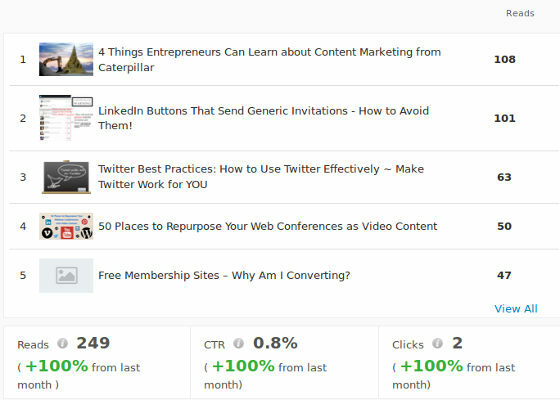 You can test out the tool free to get insights into what content on your site drives subscribers, leads or conversions. It is free to keep if you permit monetization. As TrenDemon is fairly new it may be some time before they have external content to display. Image shows path from original post through 2 posts suggested by TrenDemon to visitor subscribing. You can see one of their show units running immediately under this post. I may also have the other options enabled when you visit for testing. What do you think? Have any questions? Awesome Post and Website Amplification Tool is really useful. I hope this tool will be useful for my blogs as well for other bloggers who want to increase their blog traffic. Very Useful Information. I really want to use Amplification Tool to boost my content. Can you please suggest me best Amplification Tool. Thanks for share. Kavya sharma would love you to read ..[Ultimate Guide] to know What is Blockchain and cryptocurrency? After reading this article i am definitely going to try “TrenDemon” for my website. Keep sharing these kind of informative article. My traffic is very low, and i am looking for best ways to increase my traffic. i will apply these tips for sure. We have to write engaging content which can help readers. Now this is called a great article.. I was looking for such kind of articles.. Thanks for this . now , i am getting a lots of traffic from search engine . huge traffic just depend on our quality content . Your article is good about traffic . so Thanks again . The key to TrenDemon is that it uses your best content to keep people on your site longer. More importantly, you can use it to drive traffic to content that generates sales, leads or subscriptions. I like your stuff every time I visit your website. This is really awesome for me to learn the from your website. Thank you for sharing this article. The ideas presented here were new to me. I like the idea of the web amplification tools. You also specified about finding the converting pages and the images presented here are very informative. yeah right , i think these tools will be proved as very useful in terms of boosting any sites traffic . Even I am using some of them for fetching some more pages views . I agree with you. 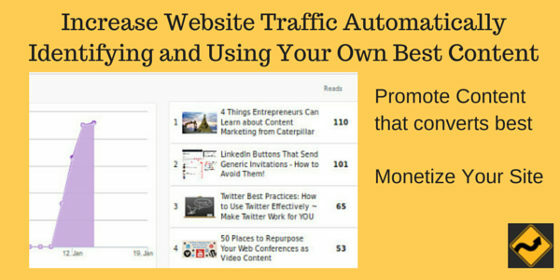 These tools will definitely increase the traffic to some extent. I have tried it. TrenDemon seems like good source to checkout the content stats and make things work better. I am surely going to try this tool and see myself how well it works and how well it can be beneficial. Aditya Antil would love you to read ..How Can Web Development Companies Benefit you in the Long-run? I must say Very very informative Post. This Tool seems to be very useful for every blogger, I would say this will be one more way to generate traffic to website. I would try it and will let you know my experience with this tool. Thank you for explaining this tool in understandable way. Blogs get traffic from many sources besides search engines. For example, using CommentLuv and doing blog commenting works very well. We also bring in traffic from social media. Yes, there are alternatives to Google Analytics. One free alternative is available from Piwik.org and I have it installed here. There is also a Jetpack plugin that provides some stats. You can read more about Jetpack WordPress.com stats here. Thanks a ton for your valuable feedback, but i am using Jetpack, and i don’t know why i got heavy html validation error for the same and that is why deactivated it. But for sure will look for other Piwik.org. What a nice idea to get instant traffic on a website. I really like your valuable post and its so helpful for all optimizer. Thanks for sharing….Please keep continuing.. I was using Google analytic for conversion tracking and yes its very complicated for me , specially when adding checkout page link there always face trouble , but after reading your post going to apply TrenDemon tool to my website. The points are very informative and the tool is worth using. I usually update my converting pages and do proper inter linking for boosting other articles. Great post Gail! You covered this tool in great detail and offered up plenty of resources to help someone make an informed decision whether or not to test out the tool for themselves. I’m definitely intrigued and will be doing some more research. Thank you for including the video, it helped answer a lot of my immediate questions. I will let you know if I have any other questions that come up. You should go ahead and sign up because it is free. Use the WordPress plugin so you don’t even have to leave your blog’s dashboard to see it. This is another reason we should have at least one compelling image in every post. If TrenDemon is fully free version, that would be Great! But $399 is very expensive for me 🙁 But really worth sharing this information for increasing website traffic by content writing. I am also a blogger but occasionally. Regular blog publishers or Adsense earners can purchase this TrenDemon. It is free for publishers. I believe the pricing is to encourage all bloggers to use the free version so that eventually their blogs will show content from other users. They will pay bloggers for showing that content or for clicks or conversions. I haven’t seen that pricing structure yet. The only reason to pay the $399 is if you only want to promote your own site’s content and never show anyone else’s (or get paid). Thank you very much to share this tool with, i hope this tool will increase my blog traffic, it is such a great tool for me thanks again. I agree we can find out most converting page, and most engaging pages but it requires analysis of your Google Analytics data which most people don’t like to do. And certainly this tool “TrenDemon” is a great option for these people. Hi, The tool is quite helpful to find the pages that are getting the most traffic and sales. I’ve just been using The Google Analytics tool to see which pages are getting the most traffic as well as using Stat Press with in WordPress. Ish Sarwar would love you to read ..Could Your Future Be Only 21 Days Away? I’d describe it as more of a sherpa, or maximizer, or visitor helper. i can tell you that it’s working on my Android 7 inch tablet. i’ll email you a screenshot. alex.